The Ontario Minor Hockey Association and Force Sports, sponsor of the OMHA Referee Program, will once again host three centralized Referee Schools to train and mentor new officials. The schools will run the weekend of September 21-23, 2018 in Guelph, Trenton and Windsor. This will be our 24th year of providing new officials with the start of their officiating experience. 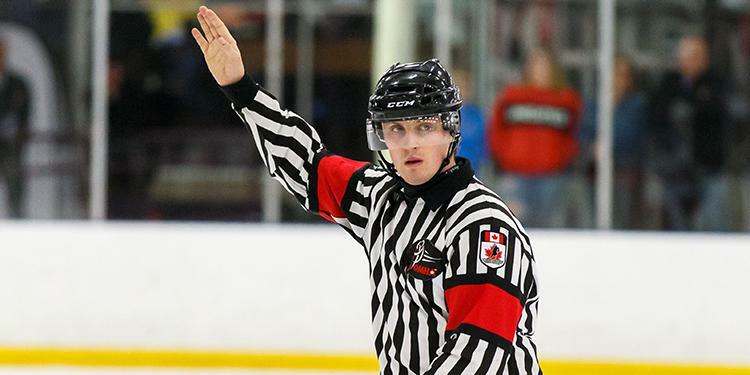 The OMHA Referee Schools provide new officials with methods and procedures of officiating in both the 2 and 3 official systems, as well as the new guidelines for modified ice hockey. They will also instruct uniform interpretation of the rules while teaching effective communication strategies and techniques. By completing the weekend, students will acquire officiating skills and rule knowledge while completing OMHA and Hockey Canada certification requirements for the upcoming season. The weekend will include an intensive, action packed agenda which will include three classroom instructional sessions, two on-ice training sessions and a final written certification exam. Force Sports, the official sponsor of the OMHA Referee Program, provides each student with a School t-shirt, as well as other giveaways. Students will also receive a Fox40 whistle, Hockey Canada Rule Book, Membership Handbook for Officials, Referee School Workbook, and Hockey Canada, Ontario Hockey Federation and OMHA uniform cresting. For more information including how to register, visit the OMHA Referee School page.